So as the "Noob" on the forum, I'm looking for any experienced advice as I continue to winter S/V Lady Anne on Watts Bar Lake. Here's the current status: Boat is docked on finger pier in about six feet of stable depth (TVA's already lowered the levels and Marina reports my side of the slip stays pretty constant after that). Keel is wound up about 80% to prevent getting her stuck in the mud. Outboard was removed and taken home to prevent freezing/growth. All sails removed and dry stored at home. Cockpit and companionway canvased down. Weekly check of foot and "bilge" areas to inspect for standing rain water (I've got a minor topside leak somewhere that let's about 1/2" of water collect after heavy rains); sucked out each time I find any. 75 Watt cage light onboard to prevent freezing, but have been nervous about leaving it "on" due to fire hazards. Fore/Aft lines/springlines all doubled up and looking in good shape. Bumpers (3) dockside, with one on the bow "just in case". Last weekend, we had a fairly impressive wind/rain storm that hit while I was on the dock doing my checks. Boat heaved and rolled anywhere from 15 to 30 degrees each axis...we had whitecaps on the lake. Noted no obvious damage to boat, lines, etc...but it sure was a "show" to watch! Our winters here in TN start getting "nasty" around mid-late January and end sometime around late February to early April...depending on the year. We don't have constant snow...but when it comes, it can be impressive; say 3-4 feet every now and then. Ice is a bigger concern, and I'm expecting some heaving icing this weekend (though the lake itself really doesn't freeze beyond the still shallows). So, I've opted to leave her "wet" for two basic reasons: First, I don't have a "free" place to store her dry, and second, I don't have vehicle stout enough to tow her anyway...great trailer, but need to beg, borrow, steal to get it moving. All in all, it's pretty cheap/convenient to leave her in until I pull out onto the hard for a day or so this spring to "dry out". Anything I should be really scared of at this point? Am I flirting with a boat being sunk by snow/ice, will I find that the entire bottom is eat out? Stuff like that? Sounds like you have her pretty well cared for. Only other thing to consider in my book is, if you have ac at the dock and boat, an automatic bilge pump might give some piece of mind! Regular checks are best though! Went down yesterday and found that one of my fenders was rubbing the paint pretty well...just flipped her around to the other side to and loosened the spring lines a bit. I'm seeing a pretty nice "beard" growing on the side facing dominant sun...but it was pretty easy to scrub off with my deck brush. I've been planning on getting a 120V automatic pump for a couple weeks now...the one I installed is 12V, and I'm never very confident I'll have full-charge, even with the solar charger. My main "worry" is (as always) the rig...having "grown up" on big Haze Grey boats, our aluminum "sticks" always seem a bit frail to me.That said, it looks like some of my slip-mates have been there a while, and are still standing. If you are floating you boat in sub freezing weather have you considered heating the boat? We are in Puget Sound and it does not get below freezing for any real length of time. Some key thoughts are open all hatches that have through hulls. They need access to the heat. Sometimes a simple lightbulb can provide enough heat to a specific area. Think rudder post. I'd pour some RV antifreeze (not toxic) down the rudder post and cable tube. I think the antifreeze is lighter than water and should remain in the tube. So, here's an update on the "ongoing experiment": We had single digit temps at night (including wind chill) for about the last four calendar days, without getting above freezing for about half of those days-my outside faucets at the house froze up over the weekend (though I've luckily got isolation valves). We've not seen above 40 F for about a week and a half. Went down to the slip last night; OAT was 27 and falling when I arrived around 5:30 pm. Lake is still liquid, with TVA reporting about 40-47 deg F water temp on average...but there's about three feet of ice-rim in the shallows, or about ten meters from the stern of Lady Anne. Measured inside cabin temp at about 40 deg F on the mercury (and that's without the 75 Watt lamp running). "Volcano" was still liquid, with no visible cracks, stresses or other indicators of damage. Keel pin pockets are dry as powder horns, as is just about everything else on the boat, to include the lazarette. Rudder tube looks ok (from the coffin) and the tiller has full range of motion. I've doubled up bow/stern/spring lines and added an opposing bow safety line...none appear to be worn/fraying etc. Did have to re-position a fender, as it seems I'm still "rubbing" a bit. Might be the fender's are too small or the lines too tight. Nothing major...just some "dusting" of the outer enamel. It's always a choice between how much I want her to "bob and weave" in swells...and how much I want to lash her down tight. Decided to cross my fingers and leave the 75W bulb on in the foot last night...she's in a plastic "caged" work-light that's supposedly "industrial". No fuel's been on board since late October, so my only real worry is the plastic cage heating up...but it seems implausible the 75W bulb (it's rated for 75W or less) is going to cause the cage to ignite all on it's own. I've got the cockpit tarped, the tiller housing wrapped, canvas over the companionway hatch, additional sheeting over the viewports and deck area just aft of the mast...and have wrapped the step/hinge area. Wrapped the chimney too. My current thoughts are that if I've made it this far, I'm "ok" on freeze damage...this is perhaps the coldest we've seen it here in at least a few years, and it's unlikely we'll see the lake freeze over. 50+ F is predicted a week out or so...for what that's worth. My final great worry is snow. I had all sorts of "ingenious" ideas on this in the summer...but having seen what the winter winds are doing at the pier...none make any logical sense now. I've moved over one slip to be away from the boat next to me and next to one of the floating cabins...offering some wind break, and no chance of someone's falling mast or a listing slip-mate causing harm. As long as I can get to her to clear it, I should be fine...but getting to my marina requires some "rural road" travel; it's feasible a good snow could keep me at bay for a week. Right now, I'm betting that whatever accumulation we get won't be enough weight to push her scuppers (which have ball valves) below water, and any melt won't be enough to fill the cabin more than what is usual after a day or two of hard rain. However, if we get a "freak" blizzard...I may just find out how tough the C22 really is. Seven months "wet" and Lady Anne is still doing great. We had record low temps last month, resulting in ice forming on the lake including the slips where she's berthed. Had to go down one or two times and break the ice (about 1/4" to 1" thick), and one of the spring lines froze solid, requiring it to be taken off, "broken down" and replaced...but otherwise, no issues. The 75 watt bulb kept the interior temp around 44 F all season...even at 0-10 F ambient. No issues with the volcano tube (enviro-safe antifreeze probably "overkill", but glad I did it). No interior mildew, though I'm going to have to scrub the topsides a bit once we get into steady spring. 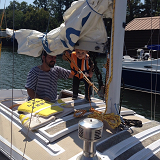 Will probably wait for late March, even April before putting the mainsail back on and the outboard. Growth below the water line looks minimal...will try scraping wet this summer, or haul out on the trailer. Love it when thinks work well!